Specifically, I found it necessary to be able to create multiple networks in Hyper-V that all use the host machine as a router to the public network and, from there, to the Internet. But, I also needed this network isolated so that it could run its own Windows-based DHCP server. So, I decided to create a virtual machine (a router, basically) that is configured with two network adapters. 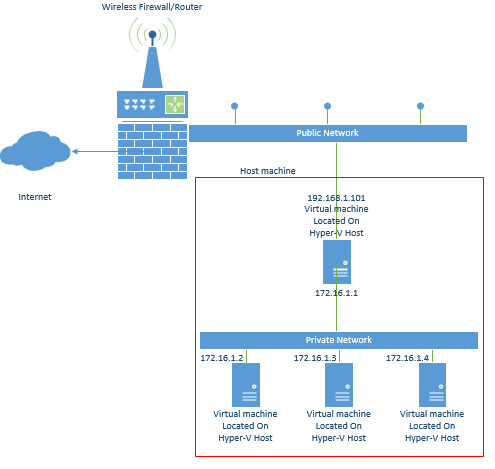 One is connected to the public network and has a public IP address and the other uses a sepete network and IP address space. All virtual machines that need to be created for my lab are then created on this private network and use the IP address of the "router" as their gateway, The image below gives you an idea of how this looks. The end result was quite good and everything worked exactly as planned.